AVLEMON SHIPPING COMPANY runs from the port of Piraeus and Gytheio to Kithira, Antikithria and Kissamos. AVLEMON SHIPPING COMPANY - The routes of F/B IONIS will stop from 10/11/2018 for two months period, due to the annual inspection. 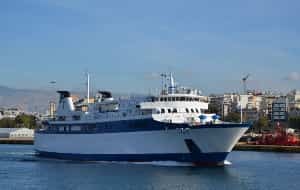 The routes of F/B IONIS will stop from 10/11/2018 for two months period, due to the annual inspection. AVLEMON SHIPPING COMPANY - The itineraries of vessel IONIS will not be served until 10/06/2018 due to mechanical damage. The itineraries of vessel IONIS will not be served until 10/06/2018 due to mechanical damage. The company will have a new update.